Structural integrity after removing inner wheel wells? Wanted a sanity check before I go cutting stuff. I currently have 6" of lift and 37s. I want to get the most up travel possible but currently at full stuff I rub the inner wheel wells. I don't want to lose any up travel. Here is where it rubs when flexed similar to the pic above. The green area has already been removed this was just an older pic. The red area is where it currently rubs. Once I relocate the air box/battery can I just start removing the inner well or will it make it too weak? The other rub area is the pinch seam. Anything that gets removed I would rebuild with 16 or 18g sheet metal. I know TNT makes a replacement panel but again I just want to make sure I'm doing this right before starting. Do I need a spot welder or can I do it with my mig welder? 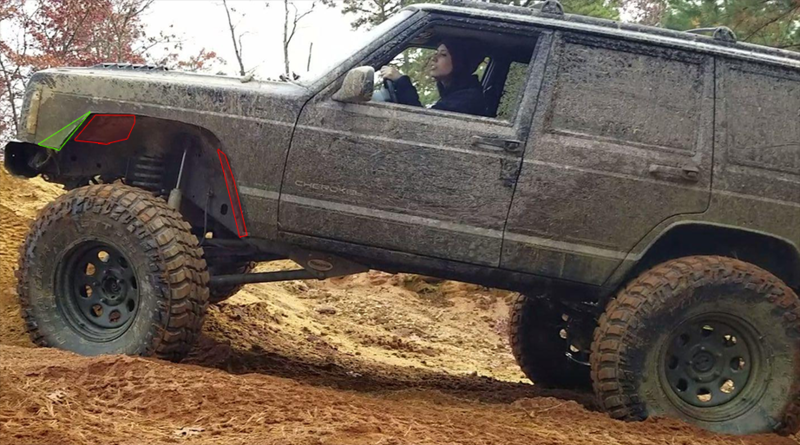 Re: Structural integrity after removing inner wheel wells? This is the panel sold by tnt forgot to include it. Most pinch seams are joining structural parts and would need to be replaced. The inner fender liner forward of the coil spring mount and above the frame rail/front crossmember is not structural. That link is going to be a big help. I didn't even think about the fuse panel on the passenger side. great article. hard to believe that upper coil mount is responsible for supporting the vehicle, but I've never heard of them getting damaged. Lux, have you pushed your axle forward at all? working on getting 37s undermine, but there's a ton of stuff like this involved. Also I'm assuming you've already bent the pinch seam over? I cut in mine a couple spots and bent it over with a hammer. You can actually pound it back a little more for extra clearance without hurting anything. I seam sealed and painted mine once I was done massaging. Any better pics of the girl in the drivers seat? Ya i can see that. Out here in the northeast the only sand we have that you can drive on is a sand pit. No go fast stuff around here. I'm planning on racing in Jeepspeed (with 35s for 2700 class) so limited on axle placement and what control arms I can run. That's why up travel is important to me even though we're in NJ. No not posting pictures of my gf/co-driver. 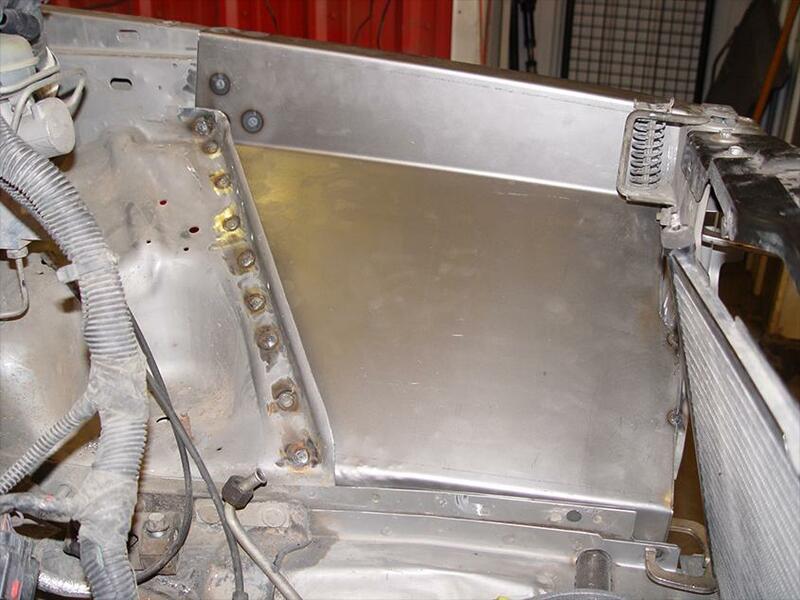 Pinch seam is pounded flat, and i will modify the hump where the intake/ecu and battery sit. Once that's done I have T&J hydro bump stop mounts going in and will just adjust the bump.